Hunter and Tyler are cool guys and great hosts. 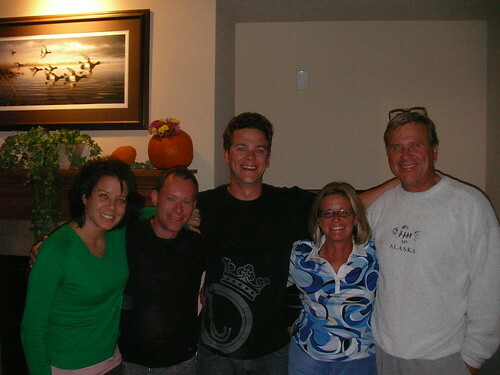 When I was in Denver in August, I was invited to have dinner with Tyler’s parents. This time it was Hunter who suggested we have dinner with his folks. I had briefly met them in a bar the previous night, but the loud music prevented real conversation. So I was excited to get the opportunity to chat properly to them. Doubly excited because Hunter’s dad is Ernie Bjorkman, a very well known and highly respected local TV news anchor in Denver. 1) This parallels between Jimmy Carter’s candidacy in 1976 and Obama’s now: the outsider status; the running outside / against Washington to the same extent; the optimism of the message; the calmness from the candidate; and the heights of passion and energy of the activists. Certainly, ordinary people hadn’t been as fired up since the 1976 campaign. 2) The difficulty in keeping journalists reporting the presidential race in as completely balanced and fair way as possible. This wasn’t necessarily because of any inherent bias or sloppy reporting. Instead – as Ernie described it in his news room – the younger journalists especially were more likely to get swept up in the rhetoric and huge crowds of the Obama campaign and so lose their objectivity. He was the one who had to sometimes rein them back in and ensure the balanced reporting that was expected of the news team.